It had been one of those days, where I had intended to go for a walk, a run, do something fun outdoors, but instead I found myself doing mindless tasks such as culling my way through thousands of photos from the last 4 years which have made my laptop remind me that it’s full every time I turn it one. 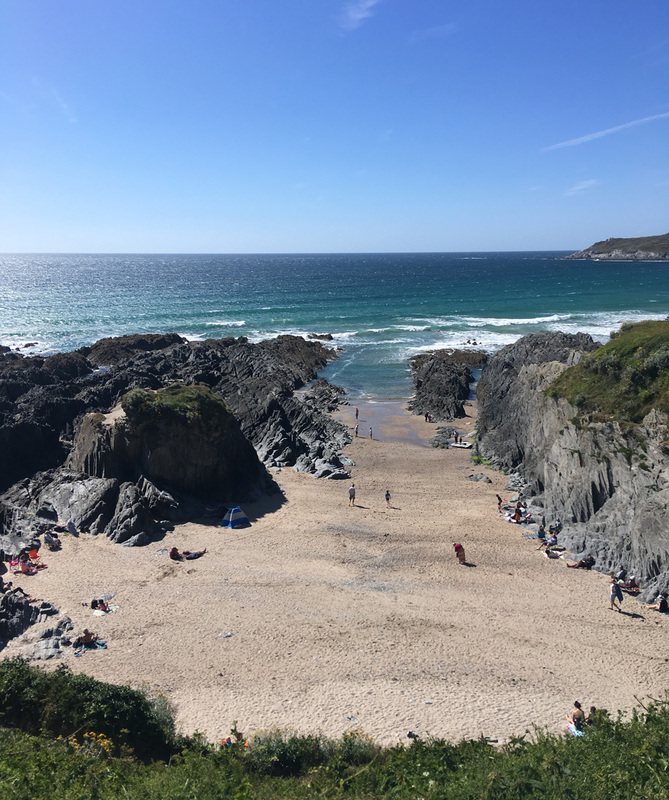 When I arrived in Devon, my sister had given me the Wild guide of the South West and I had poured over it, making mental notes of the places I’d like to visit – and a careful note of one’s which involve food. 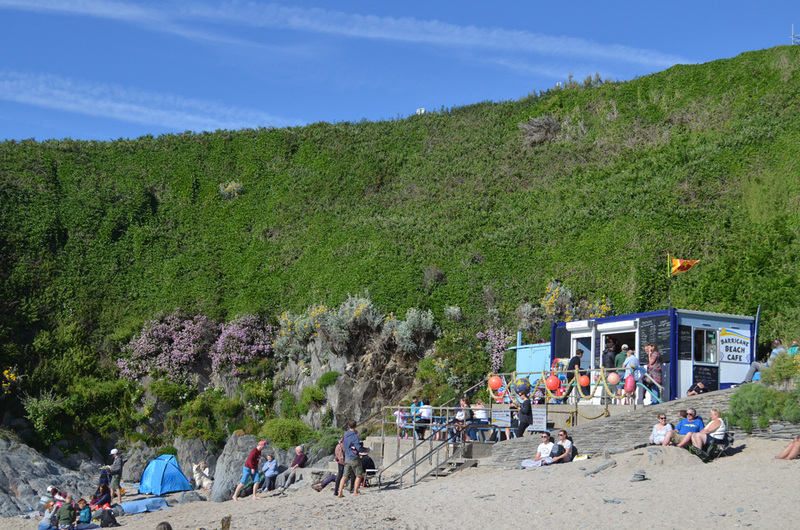 After finishing the mindless jobs, I suggested to B about going for a midsummer drive and remembered Barricane Beach Cafe being top of my food list. 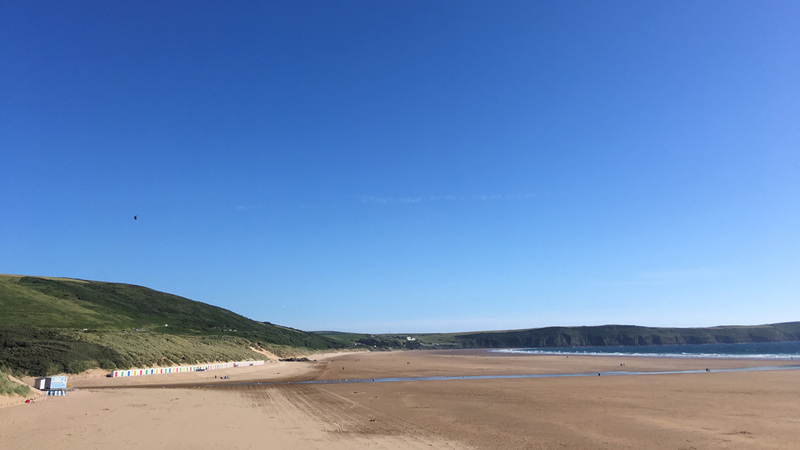 We drove north through the late afternoon traffic and into Woolacombe, it’s wide, rolling sandy beach flanked by little beach huts in primary colours. Following the road slightly further north out of town, we parked up at the top of the headland and spotted the tiny bay of Barricane beneath us, a sign pointing us down to a beach cafe. 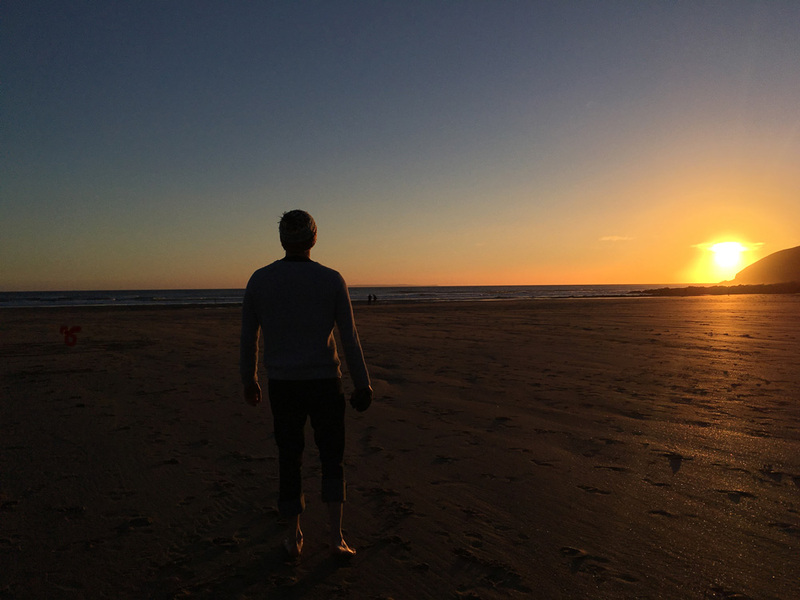 Following the winding path down, we kicked off our shoes at the beach, which is made up of thousands of crushed tiny shells, walking barefoot felt like a little foot massage. 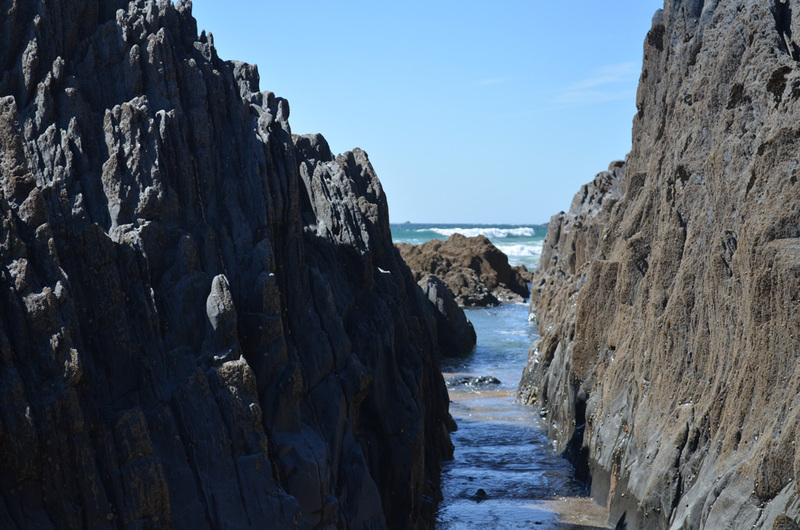 Either side of the beach, rocks stood tall over the narrow bay which becomes a natural pool at high tide. 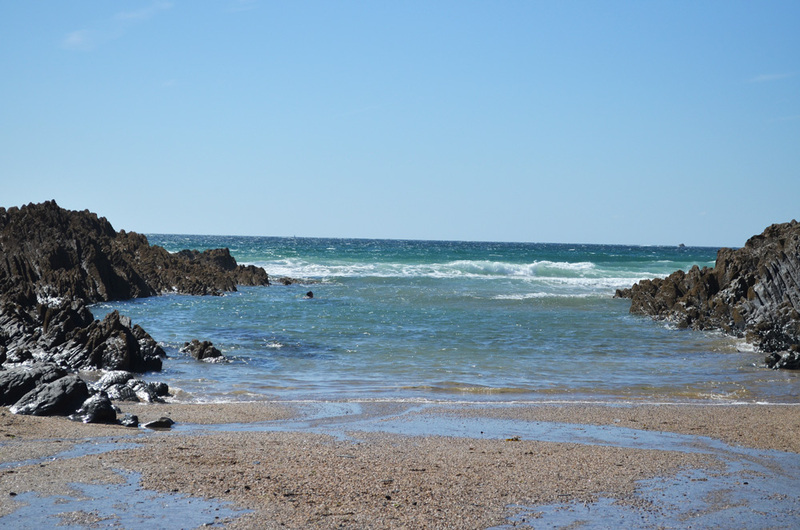 We paddled in the cooling water as we waited for the clock to tick around to 5 pm. 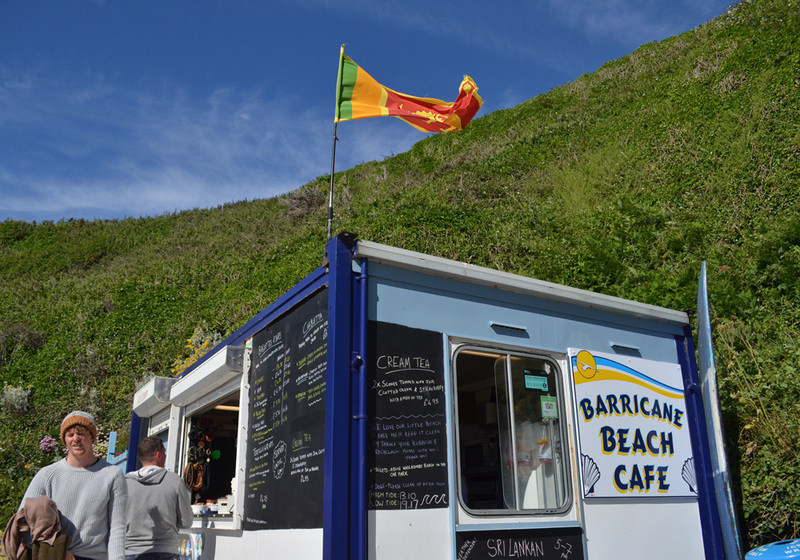 A previous old shipping container, the beach cafe had a proud Sri Lankan flag blowing gently in the wind, During the day, the cafe is a regular sandwich/cream time cafe. 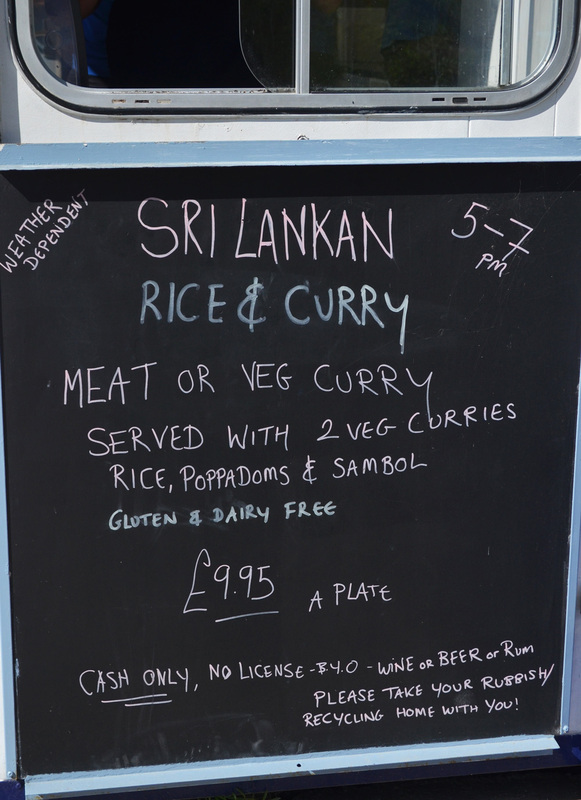 But on most nights in the summer (check the Facebook page for details), the owner Sri Lankan curry from 5-7pm or whenever he runs out. B was naturally front the queue, eager as ever for food. 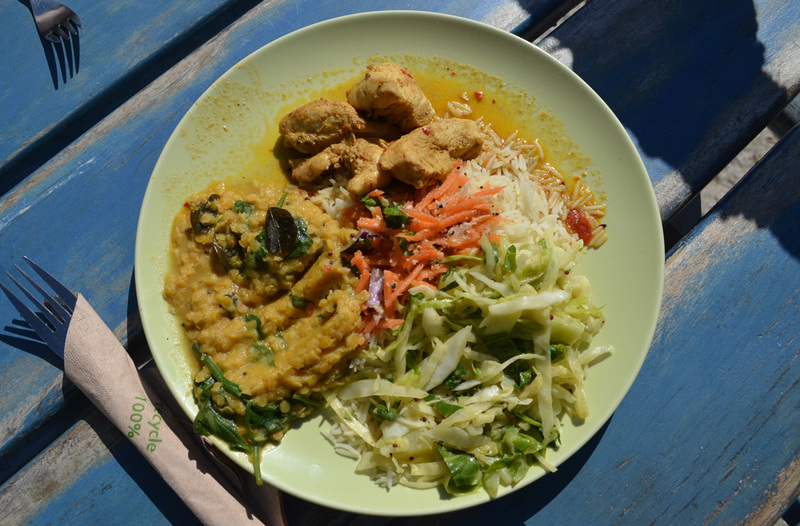 The cafe has no evening menu – just the choice of chicken or veg curry with a kind of lentil dhal, fluffy rice, a cool cucumber and greens salad, a coconut relish called sambol and a little bag of poppadoms for dipping – all served on china plates with real cutlery. And it did not disappointment. The curry was rich and fragrant, with a warm spicy edge complemented with the cool salad. I liked the balance of flavours and textures from the crunchy salad and sweet sambol. 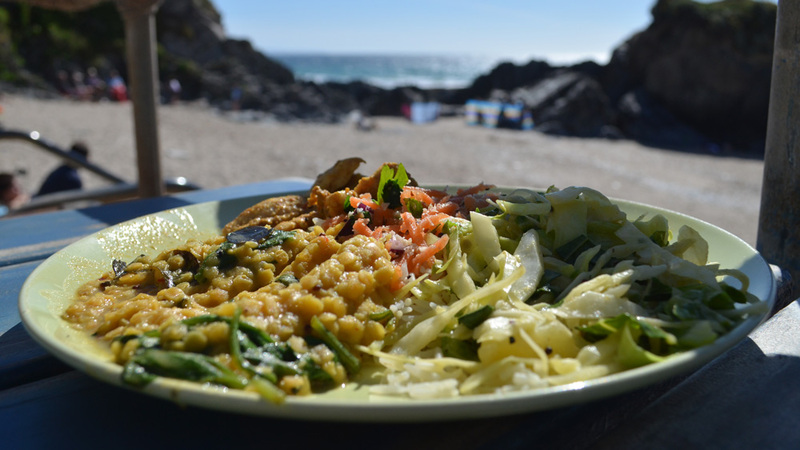 Most people take their plates down to the beach, but we managed to bag one of the 4 picnic benches outside the front of the cafe overlooking the bay, where we were joined by kids in their school uniforms and a young couple sharing a bottle of fizz they’d brought with them. Summer heaven. 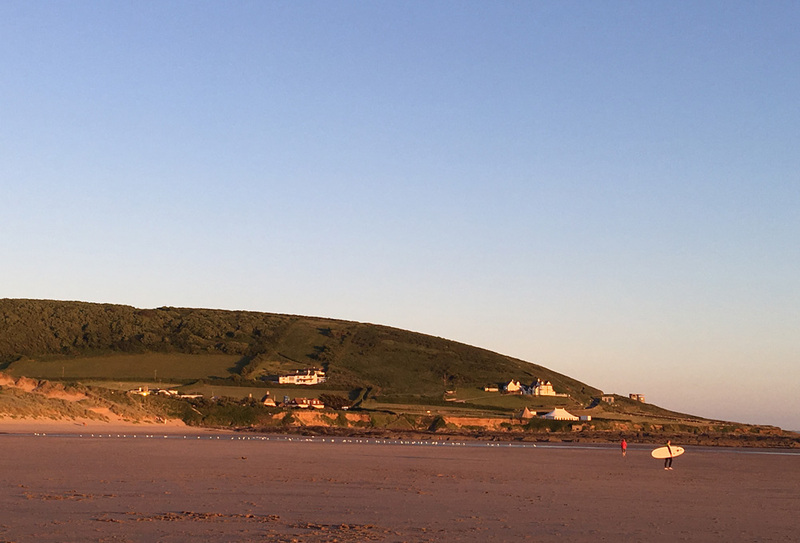 After we’d given our plates back, we climbed up one of the rocks and watched some old boys playing boules on the beach, glasses of rose in hand and a young school girl trying her enterprising luck at selling seashore flowers to unsuspecting family members. 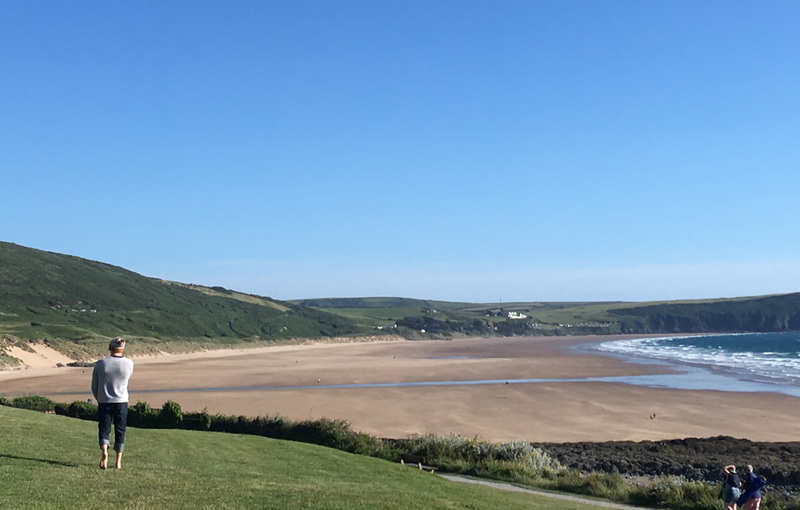 We took a quick a stroll back towards Woolacombe, before driving around the bay and over the headland to Croyde to meet some of B’s friends visiting from the Midlands. 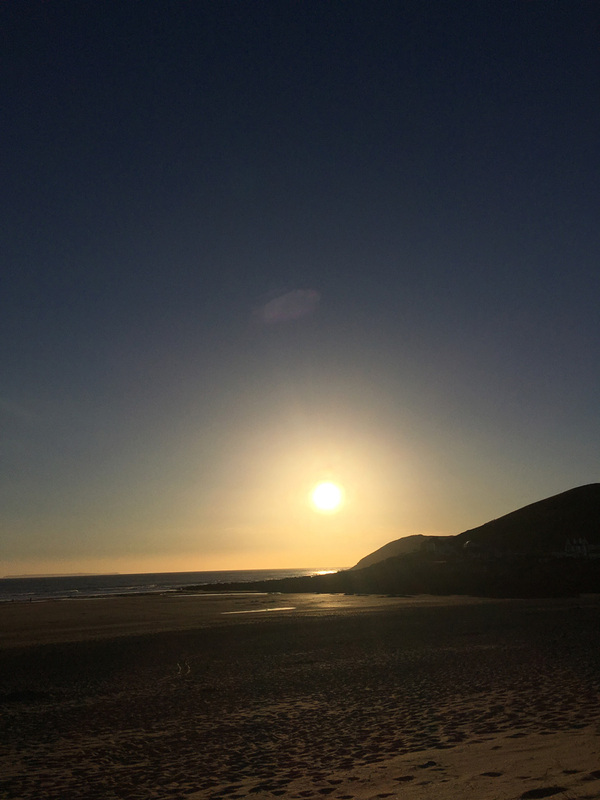 We settled into the sand dunes to watch the sunset, conversations on the World Cup and university days flowed. 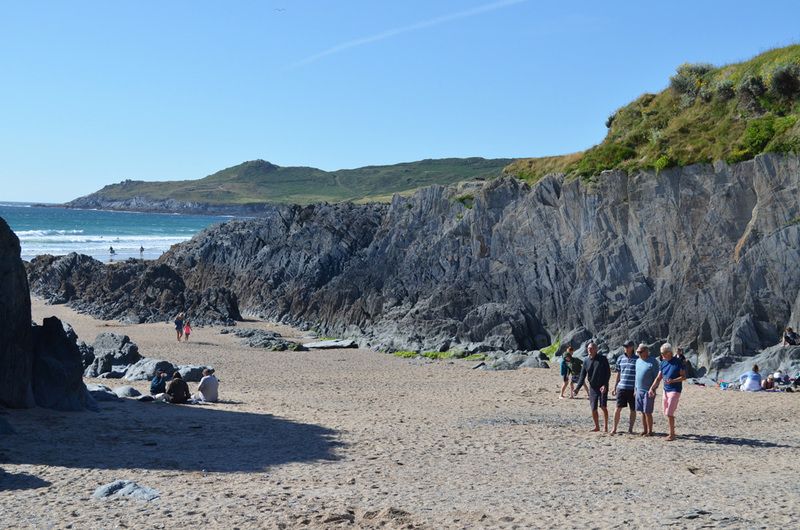 Some played football on the beach or hit the waves with the surfboard. 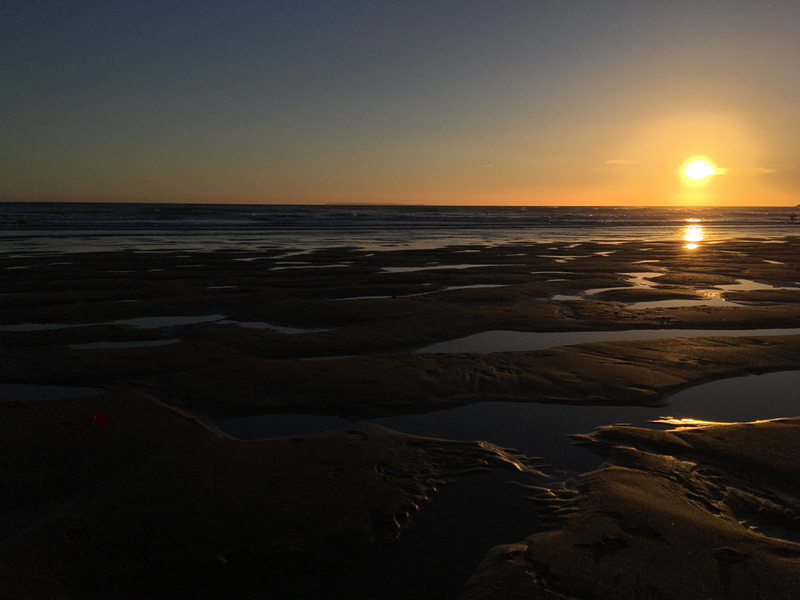 As the sun dipped lower, we ran down to the shoreline for a paddle and bid our farewell to those in the waves. A deep orange glow of the midsummer skyline remained on the shoreline as we followed the coast road back, still visible at 11pm from our bedroom window back at home.